Tour Departing on - 6th Jan, 2017. So plan you leaves NOW. EARLY BIRD OFFER - GET Rs. 1000/- OFF on Booking before 31st Aug, 2016. 06 Nights/07 Days accommodation on twin-sharing basis in deluxe room at 4 star category hotels. A complimentary water bottle everyday from our side. Land Package - Rs. 39,425/- (inclusive of all Govt. Taxes) Per Person on Twin Sharing Basis, if booked before 31st August, 2016. Post 31st August, Land Package - Rs. 40,425/- Per Person on Twin sharing basis. Tips, Insurance, Laundry, Phone Calls, Damage to the hotel property, etc. The service of private vehicle/taxi, is not included on leisure days & after finishing the sightseeing tour as per itinerary. Airfare to & from Bangkok. Visa Cost. Camera fee, soft drink, hard drink, starters. Anything not specifically mentioned under the head "Package Cost Includes" Govt. Tour Operator would not be responsible, in any circumstances, for any damages, loss, etc. that may be incurred/suffered by you if the information provided by you in the Tour Registration Form turns out to be incorrect/ inaccurate. We hold the right to alter the tour schedule in case of bad weather & other conditions beyond our control that might affect the normal itinerary. The meals at the hotel are mix of Veg & Non-Veg dishes. In case of pure veg meals (No onion/no garlic) advance intimation is must. 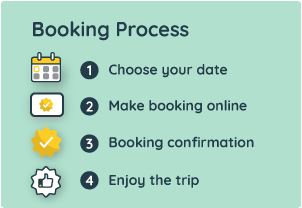 Tour Operator further reserves the right to change the itinerary and hotel, if necessary, in similar category as specified at the time of booking of Tour. Tour Operator reserves the right to cancel any tour prior to the departure, without assigning any reason. In such situation the tour will be rescheduled on a different date and we will confirm your bookings for the same In case the alternate tour date is not acceptable to you, we will refund the entire amount due and payable to you, however, you will not be entitled to claim any compensation. Tour Operator cannot take responsibility for any cost relating to the issuance and/or cancellation of air tickets and/or other arrangements not done through Tour Operator. In case of any deviation/ cancellation in the itinerary due to natural calamities or reasons beyond our control or any unforeseen surprises, cancellation charges as per the cancellation policies below will be applicable.